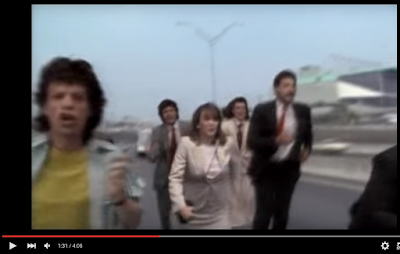 Mick begins his journey in Yonkers, on the New York State Thruway, right by the Yonkers Raceway/Empire City Casino. Mick continues running down the Deegan, under the twisting ramps of the Hamilton Bridge. Mick concludes his run in lower Manhattan on the FDR, near the South Street Seaport (with the World Trade Center in the background). Our reporter would like to have identified what he believes to be a stretch of the Bronx in the video, but he was not able to pinpoint the specific location. 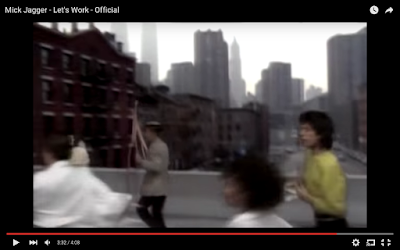 Still, he is impressed (as am I) that Mick starts off in Yonkers, and b) follows a direction-appropriate route south. 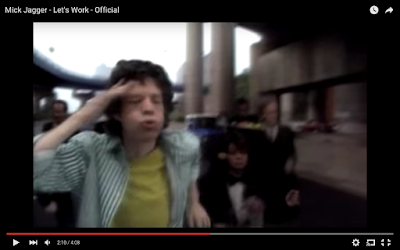 And how about the opportunity to reference both Mick Jagger & the Major Deegan in the same post? What an unlikely delight! Postscript: I just remembered that Our Man in Queens sent me a Deegan report back in 2013! How could I have forgotten the dismembered John Doe, sprawled on a rooftop? You can see the horrid sight right here. Impressive piece of music video scholarship. If I were making a music, I think I'd have chosen the Harlem River Drive to the FDR. I wonder how long it took Mick's people to get the permits. Or did we care about those things in those days? 10th St VFW Post is Back!